This week saw the release of the official Amazon Kindle app for Android. This may not seem like such a big deal, seeing how reading apps are available on iPhones, iPads, iPods, and a slew of other i-things, not to mention the dedicated e-readers. 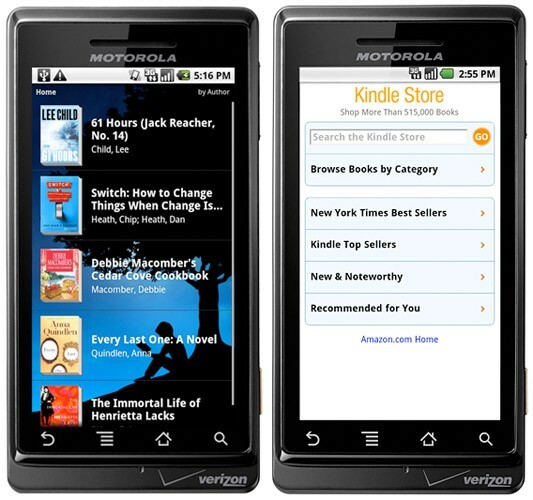 The big difference here is that the Kindle app for Android is the only e-reading app for Android phones (ie. Droid, Incredible, Evo 4G, MyTouch 3G & Slide) that can read DRM protected works without stripping the digital rights mark. This means that all the latest releases are now available at our fingertips at reasonable Kindle prices. On top of that, it leads the pack as the prime e-book app with the most variety and distribution, since the Kobo is majorly lacking in book and personalization options. Barnes and Noble have been promising an app for over a year and have not delivered. I’m disappointed guys. Really disappointed. Lisa’s Tuesday Perspective: How Many is Too Many? 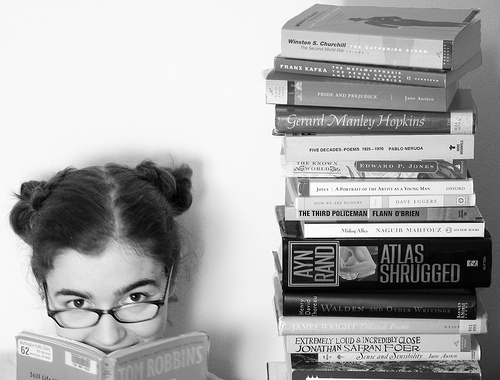 If you head over to my goodreads profile, you’ll see that I’m in the middle of reading TWELVE books. This is partially because a lot of them are library loans that I ran out of time on reading, but a many of them are books I own and just haven’t sat and gone straight through yet. This happens to me for a lot of reasons, some of them more or less insane. Here’s a little look at the books I’m reading and why it is that they’re taking so long to get off my currently-reading list. Every other Christmas or so I start this book. Last Christmas I did this again. But I’ve read it half a dozen times, and my copy isn’t exactly carrier-friendly. I get distracted by newer stuff. Now, if you’ve been around here for a while, you may have noticed that I’m a bit of a Fforde fanatic. Sadly this book is not mine yet. I’ve been checking it out from the library, and if any of you have read Jasper Fforde’s work, you know it’s a dense forest of brilliant nonsense. It takes me some time, and I just haven’t had enough of it yet! This book has a lot of potential. In fact, I’ve already bought the next three books in the series. It’s just a little young and a little slow for me. But I can’t give it up either! He had a lot of them. I’m not even a third of the way through. I love the concept of this book, and really love the fairy tale behind it, so I won’t give up on it. But again, this book is impossibly slow. Another library book. I really loved the first half of it, but then I read The Dark Divine which is a vaguely similar story, but much more my style, so it’s been hard to get re-enthused about Hush, Hush. Still, I want to finish and see if it’s worth the hype. Library book! And again, sadly slow. Zink isn’t writing in her own vernacular, and it’s so painfully clear. I’m trying to read through all of the Anne books, but again, it gets sidetracked for the hotter YA books sometimes! This book is a lot of fun, but not really impressing me much. I’d like to finish it to review it, though, because I won it, so it’s the least I can do. Okay, this one is my bathroom book. I’ve been wanting to read Nix’s books for a long time, because they’re sort of fantasy classics, but this is again, dense stuff. Fascinating, super well-realized world, but it is something easiest to take in five or ten pages at a time! The third Percy Jackson book… I had to stop reading this one for a bit because I sent my copy to my mother… don’t ask. But I’ve picked it up again and Riordan continues to be a lot of fun. For the last week, I have seen Kristen Stewart, Robert Pattinson, and Taylor Lautner all over the television and internet. The Twilight machine has begun its advertisement frenzy for the third installment of the movie franchise, Eclipse. I was not nearly as excited about this movie as it was filming, for several reasons: media over exposure, the replacement of Rachelle LaFevre, the darker directorial direction… etc. So unlike the first movie, where I stalked every site and every news source and photograph, and for the second movie, where I anxiously awaited seeing Jacob Black come to life, Eclipse was more of a passing thought. I wasn’t even sure I wanted to see it. But now, I keep hearing all these early rave reviews. People saying that this is the best one yet. That everything is finally coming together, chemistry, storyline, etc. So… I kinda wanna see it now. If only to see poor Jacob tortured by his unrequited love for Bella. What scenes do you hope make it into Eclipse? Are you excited to see the vampire army? Does anyone else think that scene with them coming out of the water looks somewhat zombie-ish? I may be uncertain about a lot, but this particular clip, sells me. We’re a little late on this! 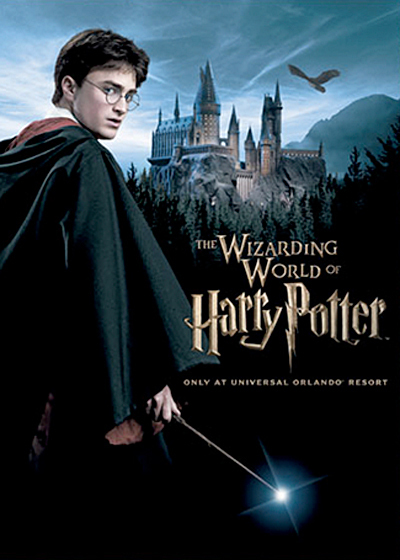 A week ago today, The Wizarding World of Harry Potter opened up at Universal Studios in Orlando, Florida. In other Harry news, the filming for Deathly Hallows is now complete. That news in and of itself hurt for me to hear a little bit. I’m really glad the book is being split into two films, because I’m honestly glad to be able to stretch that little bit of new Harry Potter joy out for a wee bit longer, and now at least I know that when the films are done, I’ll have this lovely park to look forward to! Hope the butterbeer is still fresh! Laputa is a floating island from the classic novel Gulliver’s Travels by Jonathan Swift. It is one of the many strange lands that Gulliver travels to in his journey. Laputa is an island with a bottom made entirely of adamantine, and the people of Laputa can direct where the island floats to by manipulating the magnetic fields of the metal. It is populated by a patriarchal society made up of scientists and mathematicians, except the people are not particularly logical in the way they go about things like design—for example, using a compass or a quadrant to try and design clothing, rather than a measuring tape. The king of Laputa also ruled the lands below it, mainly by fear. If a land below rebelled, he would threaten to float the island directly above them, and thus cutting them off from all sunshine or rain, and ultimately creating a famine there. In some cases rocks were thrown off of Laputa onto the cities below—which is supposedly the first idea of aerial warfare. In extreme cases, Laputa could be made to land on unruly cities, crushing them out of existence. 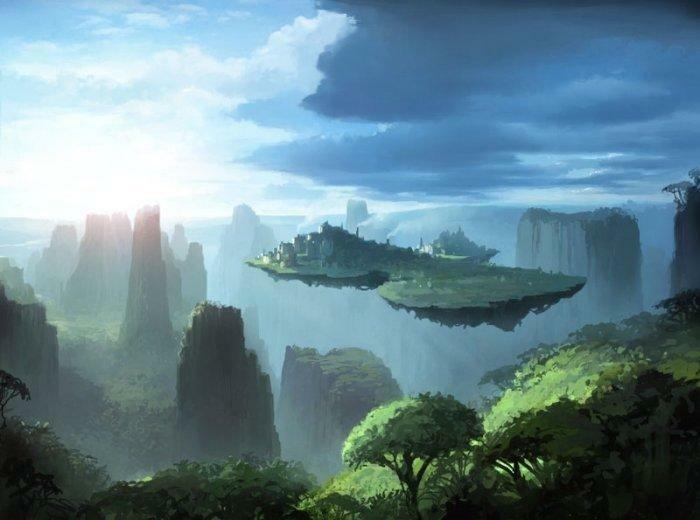 So all in all, while the idea of a floating island is really a magical and wonderful one (at least in my mind), I don’t know that Swift’s Laputa is the one you’d want to visit. Of course, Laputa was also the inspiration of Hayao Miyazaki’s film of the same name, also called Castle in the Sky in the U.S., a movie that comes highly recommended from yours truly. In case you guys haven’t noticed (which if you read the blog on an even semi-regular basis, you must have) I have a thing for book trailers. I really love the possibilities of the medium. The combination of ambiance, visual imagery, and that somehow still capture the ‘feel’ of a book. It’s hard to explain but when a book trailer is done right… you just know. This one made me giddy. Because something about it is just magical. Book trailers walk a fine line. They should be more than just an advertisement, in a way. It’s not meant to look like a commercial, it’s meant to tell the story in much less space and time, to captivate the way a blurb captivates, or an excerpt. But many people don’t understand that about book trailers just yet. Are there any other trailers you guys have seen that have really captured your imagination? Lisa’s Tuesday Perspective: Love Triangles – So Last Season? This is a debate I’ve had many a time. I’ve heard a lot of people—a LOT of people—say that they hate love triangles. To the point of vehement declarations of hate towards one or more of the parties online. Complete strangers get into heated angry debate, and feelings get hurt—which really, is kind of silly, considering that everyone is entitled to their own opinion. But people walk away from all of this saying that they hate love triangles. I’ve heard some say that it’s the oldest trick in the book (which it is, look at some Greek myths!) and that it’s been done to death. Well the fact is, love is the most common story ever told, and since love tends to happen between us messy, complicated humans, love triangles happen. Beyond that, a story needs drama to be a story, and love triangles are nothing but drama. Personally, I love the triangles. My favorite thing about fiction, crazy as it may sound, is when it rips my heart out of my chest and shreds it into little bitty pieces. This is probably why I always fall for the underdog. For the one who doesn’t even have a chance. For that fatal, unrequited love. Does it hurt? Heck yeah. Is it fair? Not really. But then, neither is life. And that kind of hurt comes off a lot better when it’s in the form of a book you can close at the end, right? Anyhow, that’s my opinion. What do you think about love triangles? What are some of your favorites?